Only need 1 shirt? No problem, email your request for pricing on smaller quantities. Blank Stock also available at ridiculously low pricing! Please note : Additional $4.50 for XXL and Larger will be added to your order. Value Priced Hoodies. 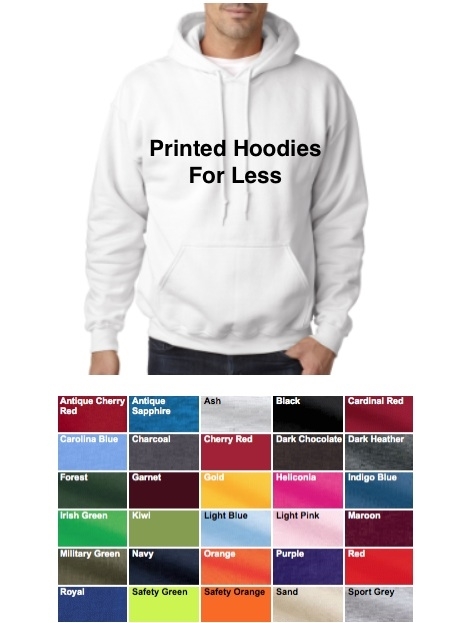 This Gildan 50/50 blend hooded pullover sweatshirt has a large front pocket that is great for holding your keys or iPod when you are on the run. The hood sits naturally on the back and the soft fabric doesn't allow for a stiff hood that is firm and pints out. Made from 50/50 cotton polyester blend and the bottom cuff uses Lycra to stick to your body so you don't get that baggy look. Email for ridiculously low prices on blank stock. You can assort colors and sizes.